Princess & the Paper presented by A Jillian Vance Design: Kids Blog Hop! Episode #15 AND GIVEAWAY! Kids Blog Hop! Episode #15 AND GIVEAWAY! Hey guys! 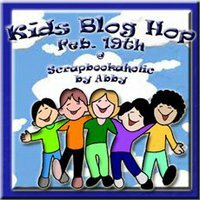 The Kids Blog Hop is finally here! You should've come from Taylor's Blog but if you just happened to arrive here you need to start at Abby's Blog. Today my project is one that you may think is too hard or that you can't do it. Well... with this tutorial it is so very easy! Make this with your child or for your child! It is a crown using Once Upon A Princess. This is a great idea for a Birthday Party craft... just maybe without the stickles for that :) Anyway... Here is the Tutorial! Here is the final picture. I took the ribbon off. 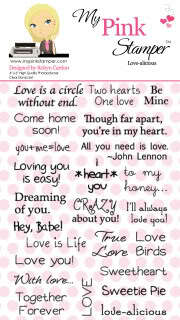 Robyn, My Pink Stamper has been so sweet and has donated the Love-alicious stamp set! 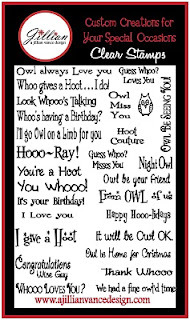 And, I am choosing to giveaway my Owl So Cute stamp set! All you have to do is become a follower and leave a comment, if you are already a follower, thank you! Just comment saying you ARE a follower and LEAVE YOUR EMAIL! If you don't and I pick you I will be picking AGAIN and you won't win the set. That is just what I need to do because I need your email. I am choosing TOMORROW so comment now while your here and keep hopping! Please leave a comment at every stop! We want this to be a very successful hop! Actually, you only have one stop left, and that is one of the very cool hostesses, Erika at Cricut Love. Thank you all for hopping today! Here is the full list just in case you missed someone! Thank you all again for hopping today! You're getting to be a professional "hop stop" aren't you? You did a good job on your video, (you're getting real professional at that too.) Great job. Talk to you again soon. I'm a follower... Love your project, thank you for sharing. I am a follower. what a great project. Hi Jillian i'm mariah and i love your stuff. thanks 4 sharing. Cute crown!!! love it!!! thanks for being part of this hop! this is so nice you did an awesome job TFS!!!! Migonette (7) says: i love it. I like your crown it is very good. What a wonderful project! This would be great for a girl's birthday party! I am a new follower and I look forward to seeing what else you create! You are VERY talented! I am already a follower thanks for sharing your crown. you did a great job. great job on the crown! thanks for sharing. im a new follower. Hi I am Kaleigh, I am 4. My Nana is typing for me. I am my Nana's Craftin' Buddy. I like your crown it is pretty. You did a great job on your project and the tutorial. I follow you :)!! What a super project Jillian and all the 'experience' tips are very helpful. 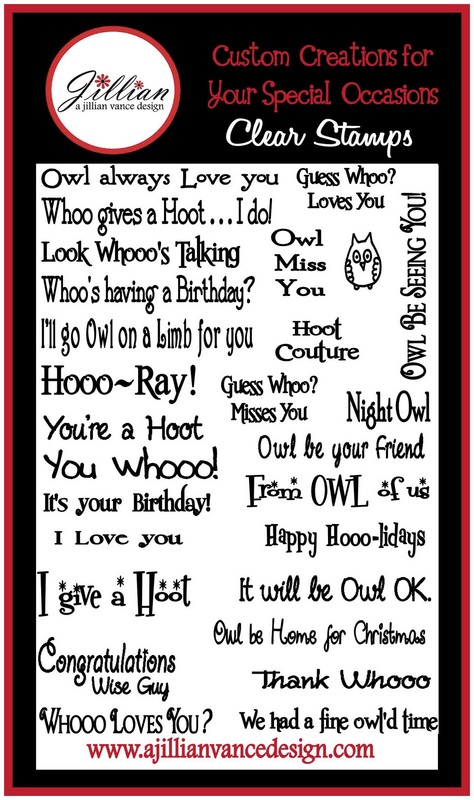 Checking out your blog your are very talented and have your own stamp sets...way to go. Will be following your blog to see were your talent take you. TFS. Already a follower, and love your crown. It would be a fun project to make at a party..TFS! this is bailey age 8. that is a cute crown. thanks for sharing it with us. Great job on youR crown!! I am following your blog to see what other creative stuff you come up with! TFS!! Such a great job. Just adorable. Sweet crown! I'm a new follower! I enjoyed your video tutorial! I am a new follower and look forward to your future projects! You do such a great job. Already a follower. This is a great project! TFS I am already a follower!! What a great video! You are a pro! I'm now a new follower. Cute crown! Love it! New follower! Super cute! I have this cartridge and just showed my daughter (almost 4) your project and she said she wants to make one tomorrow. :) Thanks for sharing! I am a new follower! Taylor (age 5) - We need that (cartridge) so we can cut the crown. Can I get it for my Birthday? (We'll see). Mom - such a cute crown! I think we will have to convince my hubby to get the cartridge so we can make one! We're new followers, thanks so much for the chance! We've had fun!! So cute! I didn't even know it was on there!!! Way to go, I am so proud of you! Cute project! I am a follower. Great video. Thanks for participating in this hop. Your video is amazing!!! Love your project.You are a very lucky young lady and your talent is encreditable!!! My grandson who is 1 is always with me in my craft room. He and I do a lot of silly crafts together, we have so much fun!! Thank you for sharing your inspiration with us! Ashlynne (6) loved your video and how you made your crown. She loves to Cricut and Cuttlebug. She also loves Stickles too! TFS!! Very cute crown!! I am making one for my almost two girl maybe I'll use this cart for her birthday party. Is an awesome cart!! BTW: You have an ATG Gun, How jealous I am!! Are we watching the next My Pink Stamper?? TFS!! Take Care!! Great job, a video also! I always enjoy the videos . You made that crown look so cute and so easy to make. Keep up the good work. I love the crown. I don't have that cartridge yet but it is definitely only my list of ones that I'd like to get. Thanks for sharing! I'm a follower. I love your super cute crown project, thank you for sharing it. Great vid! Just starting out on my hop- a-long journey. What can I say I love crafting with kids! We started Kona Kid Krafter's just for kids Challenge Blog, I am admin at Stitchy Bears Kids. Kids are so creative and amazing! So glad to be a part of all of it. Such a cute project. I am also a follower now. Crowns are the best project to make at birthday parties. They are always so unique like each guest. NiMu(age4) said, this is so cute. Your crown is very cute I can't wait to try making it! I love your new stamp stamp. I like the crown you made, and I really want to try it. This is so cute & an awesome video! I forgot to leave my e-mail it is sar342@aol.com. I would LOVE to win your stamp set. Jillian - I am so impressed with your creative talent :) I love this crown. When my daughter was 6, we had a princess party - wish I had this tutorial then - that would have been fun for the girls to do at the party! Really enjoyed this blog hop! Love your princess crown, I need to make one for my 3 year old GD. I'm too late for the blog candy, but I just enjoyed being here! OMG.. you not only did an AMAZING crown but you did a video! I am so impressed how comfortable you were on the video! There is something totally amazing to me for someone so young to do! LOVE IT! I hope you enjoyed the blog hop... I have been waiting to comment on this forever! Thanks for inspiring all of us!